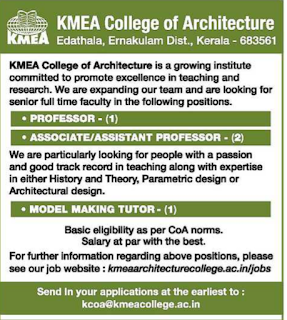 KMEA College of Architecture,Kerala has advertised in THE HINDU newspaper for recruitment of Professor/Assistant Professor/Associate Professor jobs vacancies. Interested and eligible job aspirants are requested to apply immediately.Check out further more details below. 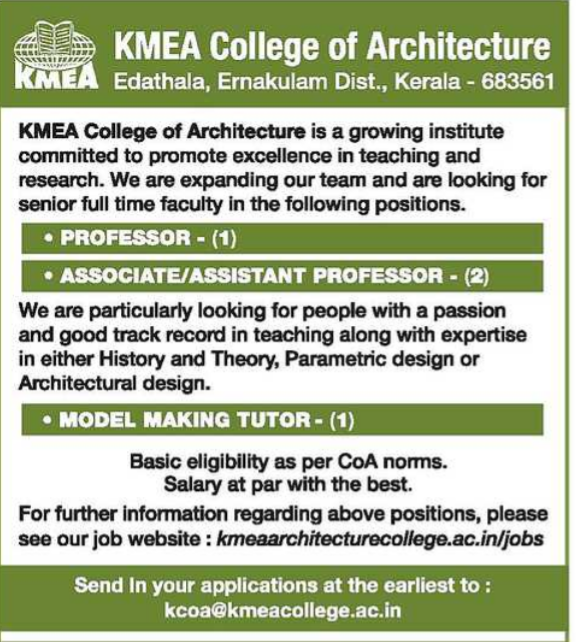 Name of the College : KMEA College of Architecture, Kerala. About College: The KERALA MUSLIM EDUCATIONAL ASSOCIATION (KMEA) was established in the year 1955 with the noble aim of promoting education among minority communities, financial assistance to needy students and setting up educational institutions.At present, the KMEA runs the Architectural college, Engg. College and Arts & Science College at Kuzhivelipady, Seethi Sahib Memorial Polytechnic at Tirur, the Al-manar Public school, a Pre-primary Teacher Training Centre and several hostels at Ernakulam. In either history & theory,Parametric design, or architectural design. At par with the best. How to Apply: For further information regarding above positions, pls see our job website: kmeaarchitecturecollege.ac.in/jobs.